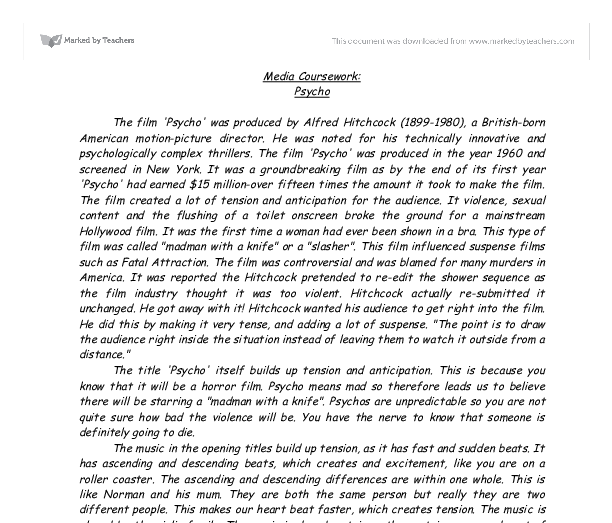 Media Coursework: Psycho The film 'Psycho' was produced by Alfred Hitchcock (1899-1980), a British-born American motion-picture director. He was noted for his technically innovative and psychologically complex thrillers. 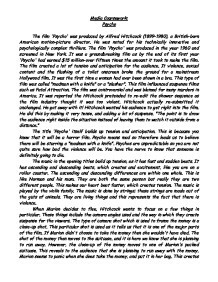 The film 'Psycho' was produced in the year 1960 and screened in New York. It was a groundbreaking film as by the end of its first year 'Psycho' had earned $15 million-over fifteen times the amount it took to make the film. The film created a lot of tension and anticipation for the audience. It violence, sexual content and the flushing of a toilet onscreen broke the ground for a mainstream Hollywood film. It was the first time a woman had ever been shown in a bra. This type of film was called "madman with a knife" or a "slasher". This film influenced suspense films such as Fatal Attraction. The film was controversial and was blamed for many murders in America. It was reported the Hitchcock pretended to re-edit the shower sequence as the film industry thought it was too violent. Hitchcock actually re-submitted it unchanged. He got away with it! Hitchcock wanted his audience to get right into the film. He did this by making it very tense, and adding a lot of suspense. "The point is to draw the audience right inside the situation instead of leaving them to watch it outside from a distance." ...read more. The type of bird he stuffs is preys. The significant of showing that he stuffs these birds is to show that he maybe also preys on other things too. He also preys on weaker things than him. It shows he is fond of them and he maybe acts like them too. Norman refers to 'we' when he is talking. This implies that there is someone else in the house with him. Of course the audience doesn't know that, so they want to find out and so they wait in anticipation. This builds up a story for the shower scene. People then start to look back at the evidence to see if they can build up who the killer might be. His conversations include references to death and entrapment. This can be clearly seen as he says to Marion "you eat like a bird". He says this when there are dead birds around on the wall in the room she is eating in. This has an effect on the viewer as they get more suspicious of Norman at this point. Norman is not completely sane in the office as he knows exactly what a mental institute is like. This creates suspense because we don't know what he is exactly capable of doing. His mood changes very quickly, as well as his emotions and the tone of his voice. We know that he is isolated. He stares into space, he is blank minded. ...read more. The music quickly fades out, living silence. The effect this has is that people wait in anticipation for what will happen next. The camera angles which are used throughout the film were used to manipulate the viewer in unnerving them and creating tension. The long shots of the house and then the medium shots of Norman Bates, these connect the viewers in associations with the gothic house, which is mysterious. Norman makes the viewers want to go in the building, but of course we don't for a long time. By using these camera angles, we see most of the outside of the house, leaving us to visit the inside only. There is a mixture of shots that Hitchcock has used. The camera usually does a close up of the money, even though the main story is not about this. This has a huge effect on the audience as it misleads them into thinking about the money all the time, and keeping an eye on it. Psycho was a terrifying film in its days, and still to this very day it makes viewers tense with anticipation of what's to come. Many different and subtle innovative techniques were adopted to manipulate its audience. These techniques have succeeded, with no problem. They have been effective enough to get the audience right inside the film, and this is what Hitchcock wanted. Hitchcock has made a good film which makes you anticipate all the time, so you wait of what's to come next. ...read more. In fact, lighting and shots together play a very important part in intimidating the audience as well as the actual characters in the film. The music in "Psycho" is all composed using string instruments. It is magnificently done and creates excitement and suspense at the same time. How does hitchcock create and maintain tension in his 1960'S film 'Psycho'? When Marion arrives at the motel there is minimal background noise other then the rain this is very effective because it makes you that she's alone in an isolated place where no one is around. The silence makes the natural/unnatural hesitations in the speech more disturbing and therefore builds tension. and his situation, however it's just that the people around him didn't fully understand what he was saying, or didn't detail his words in the sense that he was reciting them, "...I don't hate her-I hate what she's become. I hate the illness." Hitchcock also uses close-up shots of the money to show that the $40,000 is Marion's prominent thought, also the fact that she is constantly glancing at the envelope adds to this effect. We are then shown a close-up of her suitcase this indicates that she is leaving. We wanted to allow audience interaction whilst creating an eerie atmosphere. We thought of the use of candle light to promote this. The poem finished with an invitation to join us as we moved out of the barn with our instruments ready for the song.